Good morning book lovelies! 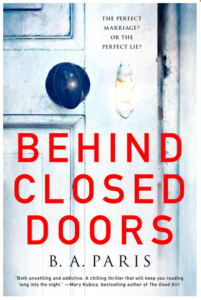 This morning prior to work, while drinking my first coffee of the day, I sat down to continue, Behind Closed Doors by B.A. Paris. This is my first Paris book and it is definitely an edge of your seat thriller. Truth be told, I am finding it really, really frustrating! I like it. I can’t put it down but I am getting so aggravated it is actually a wee bit stressful. Aptly named, the book is about that couple we all know that seems just so damned perfect. However, it’s what goes on behind closed doors that gets interesting – or horrifying as the case is here. I am 60% through this book and am loving the past/present alternation of the chapters; I frequently enjoy books that are formatted this way. My main aggravation with the book comes with the behavior of one of the main characters. It is definitely a book that makes you think of what you would do if you were put in a certain situation and I can’t help but feel like our protagonist makes some very weak decisions – but really who am I to judge unless I am in the situation? Have you read this book? Did you find yourself feeling stressed and angry while reading it? I know it is going to come to the conclusion I am hoping for….I mean, it has to, right?? Ugh, I have to get home and read more!!! < Previous Happy December 1st!! !